Mark Zuckerberg has his own personalized stationery, designed in house. We've got pictures. Mark Zuckerberg has his own personalized stationery, designed in house. We’ve got pictures. You won’t know this unless you’ve sent Mark Zuckerberg mail the old-fashioned way, but the Facebook CEO has a personalized stationery set designed in-house by one of the company’s designers, Ben Barry. “Mark gets a lot of mail thanking him from people with amazing personal stories made possible because of Facebook. We wanted to make something a little more personal and special for him to respond,” says Barry in his portfolio. The seal is cleverly designed: it has the elegance required of that sort of formal, pre-web design, but is sharp and modern enough to befit the CEO of the world’s biggest social network. 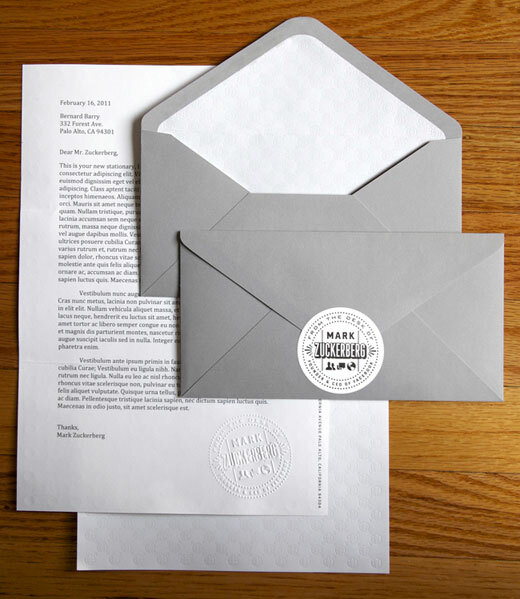 Of course, Zuckerberg may have requested this design for the sake of making his fan-mailers feel special, but anyone with his level of notoriety and wealth is going to end up with the kind of ego that demands a personal seal. Good job on Barry’s part for making it work.